Yes, the big news for July is inescapable. 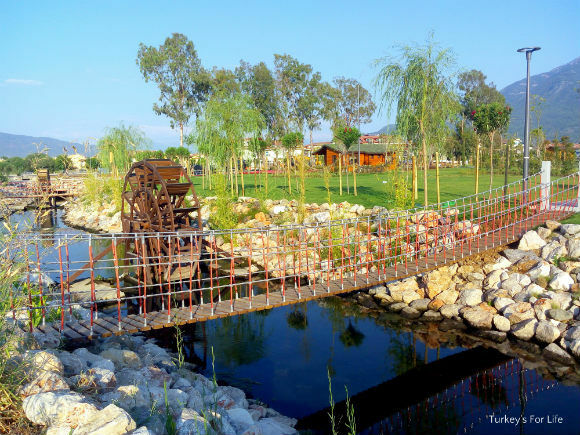 After much toil, the region’s largest recreation area finally opened under the name of Şehit Fethi Bey Parkı. It’s already proving ridiculously popular, especially on the cooler summer evenings, with Turkish families. The children’s play areas are packed and the walkways full with evening strollers. Little updates are filtering through as the days go by and we can tell you that picnics in the park are forbidden – just in case you’re fancying laying those picnic blankets down and getting the food out. The park is a thoroughfare for us on an almost daily basis and it looks as though – at least for now -there’s going to be a permanent staff presence where maintenance and gardening is concerned. 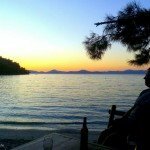 We love the place so have put it on our Fethiye Must Sees page. It always feels strange writing about Fethiyespor at this time of year – football is winter Fethiye life; not summer. But the football season waits for no one and prep is very much underway. In July, the 2. Lig groups were announced and Fethiyespor were drawn in Red Group (Kırmızı). The 2018/19 Fethiyespor fixtures are out and our first match, on the 2nd September is away. The first home match will be on 9th September against Konya Anadolu Selçukspor and will no doubt be an evening kick off due to the heat. Whilst we do prefer daytime matches to the evening kick offs, at least we get to see some cracking sunsets over the stadium. Transfer season is seeing lots of comings and goings and Barry has worked like a trooper to get the league table, fixtures and squad all up to date. We’ll share those with you when all is prepared – I need to add some bits, too. Wow, this is just not like us – we were very beachy throughout the month of July. Well, it’s always nice to explore locally, and, at the same time, continue to bring our Fethiye Beaches listings up to date. 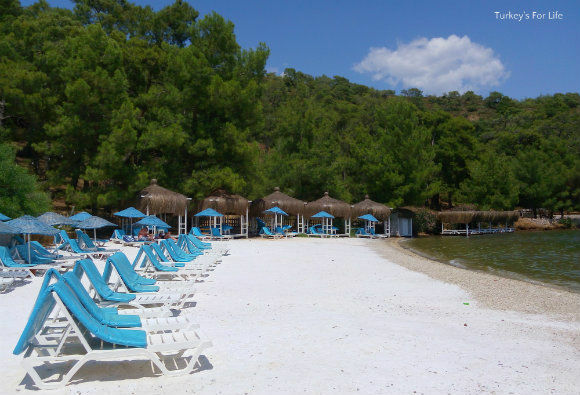 We had a beach to update – Aksazlar Bay – because that had a face-lift after coming under new management last summer. Aksazlar is really chilled and has imported quartz sand that, magically, doesn’t heat up in the sun. Keep those toes cool as you wander around. Days at the beach are much easier when you have beachy friends out to visit and Aksazlar was a day spent with said beachy friends. We also went further around the Fethiye peninsula to spend the day at the new JJ Beach Park at Büyük Boncuklu Koyu. Again, this is such a lovely chilled beach. And, because it’s further around the peninsula, the sea is crystal clear and lovely and cool. Perfect for these hot summer temperatures! And we did say we’d been busy! Towards the end of June, a guy we know took over the reins at the beach and restaurant on Şövalye Island. Şövalye Adası Beach & Restaurant was born, and, last week, we got the boat across to go and say hi and have a look around. There’s a service boat that goes over to the beach and restaurant every hour from the jetty near Şat at the end of Çalış Beach and that has just made life so easy. We’ll definitely be back here sooner rather than later – it’s an island and it’s relaxed and it’s breezy. Bliss! We’ll have more beachy updates for you in August because we’re on a mission now to make sure our information is up to date for readers. That means more beach explorations! In June, we introduced our little weather summary section to these newsy updates, so here’s the second instalment; what the weather did (or was supposed to do) in July. Now, there’s a slight flaw in our neat little weather squares. These weekly weather forecasts are shared each Monday on our Facebook page. As you well know, it sometimes happens that there are 5 Mondays in a month – not 4! July was one of those months. However, for the sake of keeping things neat and tidy – and because it’s summer so it’s hot and sunny all the time, anyway – this is the first four Mondays in July. Not too much variation and the 5th week was pretty much the same. These temperatures are a bit deceiving because July was also very humid. We actually felt really stifled at the beginning of the month and took ourselves off to Akyaka for a couple of nights just to get cool. The temperatures in Akyaka were higher than Fethiye’s but the air is much cooler. We’ll be telling you all about that little jaunt in the coming days / weeks. If you don’t want to wait for Mondays, don’t forget you can keep your eye on the daily weather on our Fethiye weather page. In July, we got a new sign in Çalış which has divided opinion. Some people don’t like these letterings in towns. We’re in the opposite camp and think they’re a bit of fun and a nice greeting as people arrive in the area. So, this is the offering for Çalış and it’s situated at the crossroads as you enter the area from the D400 road from Dalaman Airport or, in the opposite direction, from the Antalya area. For us, it just says, ‘You’ve arrived. Welcome.’ After a long drive, or if you’re arriving for your holidays, you know you’re at your destination. It lights up at nights, too. Speaking of Dalaman Airport, July was the month the new terminal opened. As with our Çalış lettering, much divided opinion there as to the experience. It seems to depend on flight times, and, therefore, the length of queues. We’re yet to go inside – we avoid flying whenever possible – but will no doubt experience it for ourselves, one day. The summer heat has put pay to much experimenting in the kitchen so we’ve been relying on old favourites throughout July. National Avocado Day a few days ago meant we just had to share our guacamole recipe. And hot sunny weather is always a good excuse to indulge in some fruity frozen yoghurt. Our friends in the UK have been enjoying a summer, for once, so we also re-shared our old summer meze recipes which are perfect for the barbecue. And not so much ‘in the kitchen’ as ‘what you love to eat.’ We shared our post where you told us about all your favourite Turkish foods. Loads of lovely dishes in that one. As for eating out, we had friends here at the beginning of the month so we just had to take them to the very popular Babzen Kebab. We ordered a mixed kebab for all of us – and were defeated. It was huge and it was yummy – and we all got very full. You can see the kebab, here. We’ve got some new recipes for you for the month of August so look out for those. In the meantime, you can use our existing recipes to cook up some Turkish dishes. Our most liked Instagram photo for July? Well, very apt that it’s a photo from Fethi Bey Park. This park is definitely going to become an Instagram stalwart as the months go on! Oh, and not Fethiye, but just before we wrap up July, we have to give mention to Göbekli Tepe. Congratulations to the site on making the UNESCO World Heritage List. You can view our page and map for the full list of Turkey’s UNESCO recognition.